Civil rights body Shushashoner Jonno Nagorik (Shujan) said use of RPO as a 'weapon' against any individual or political party will hinder fair election. "Representation of the People Order (RPO) of 1972 is the most significant law during any election and it should not be misused," said Shujan Secretary Badiul Alam Majumder at a roundtable discussion on Sunday. 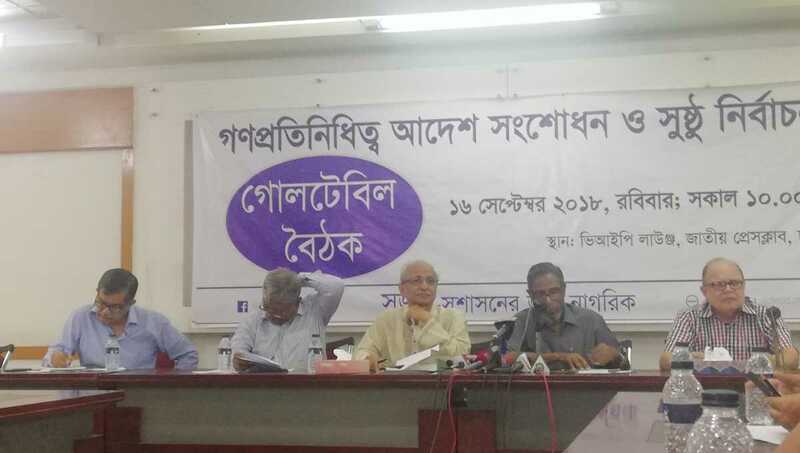 Shujan organised the roundtable discussion titled 'Amending the Representation of the People Order, 1972 and Fair Election' at the Jatiya Press Club, reports UNB. Badiul Alam said different stakeholders, including the Election Commission, the government, administration and political parties, have certain roles to play in ensuring a fair and neutral election while the RPO is the most important tool in this regard. Various changes have been brought in the RPO in recent times and the move to incorporate in it the EVM use is the most significant one, he said adding, "The government's extreme interest about EVM is questionable." The government should amend the law considering public welfare rather than using it as a weapon, he added. Shujan President Hafiz Uddin Khan alleged that the electronic voting machine (EVM) system is highly controversial even in many technologically advanced countries. The government should not include the EVM use in the RPO without having consents from all political parties, he added. While presenting recommendations of Shujan for the upcoming national election, it's central coordinator Dilip Kumar Sarkar said, "'No-vote' should be introduced in the election so that voters can give their opinion through the ballot. " Provisions should be included to register nomination papers online, register income tax details of female candidates for the reserved seats, ensure punishment if anyone provides fake information in one's nomination paper and introduce guidelines for social media to avoid any propaganda. The speakers also called for simplifying the registration system of political parties. Chief coordinator of Ganasanghati Andolan Junaid Saki, Advocate Subrata Chowdhury, Barrister Jyotirmoy Barua, Prof CR Abrar of Dhaka University's International Relations and Shujan member Syeda Rizwana Hasan also spoke on the occasion.